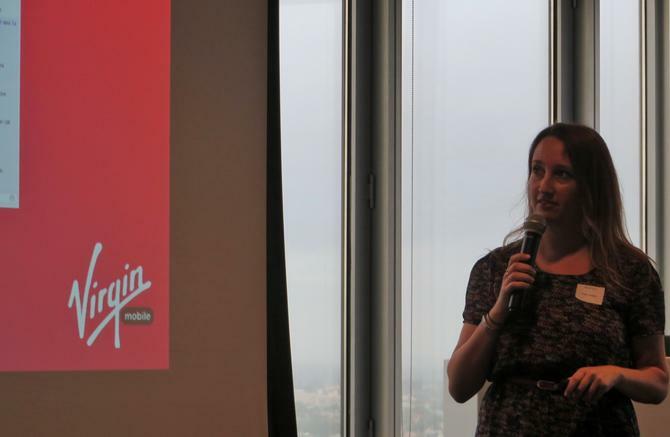 Virgin Mobile associate director of digital experience, Alicia Mack. A large number of likes on Facebook doesn’t always equate to a large amount of brand love, according to a marketing official at Virgin Mobile Australia. Followers on social networks won’t all be brand advocates and a large number of them might only be there to vent their grievances, said Mack. Virgin Mobile has attempted to redirect complaints about service instead to a Lithium message board, where people can find help from support technicians and other customers, she said. “We’re very, very happy to accept a smaller Facebook or brand consumer community to be able to siphon a lot of the service consumers elsewhere,” Mack said. A company like Vodafone Hutchison Australia with a vaster social audience than Virgin has suffered from a flood of complaints on platforms like Facebook and Twitter, she continued. The social noise got the infamous hashtag “Vodafail” trending. “Consumers got really pissed off at Vodafone and took to social networks to talk about it. That was picked up very, very quickly and still to this day – years later – they’re still trying to overcome that,” Mack claimed. Virgin Mobile had a PR disaster of its own when it increased international call rates to a few countries, and one affected customer caused a massive headache, Mack explained. But while there is an element of defence to social, it is also opens opportunities to do big marketing at a fraction of the cost of TV and other traditional advertising. Virgin Mobile has a smaller budget than the big telcos but sees social as a way to “punch above our weight,” Mack said. For example, a recent social-by-design campaign by Virgin featuring Brad Pitt’s brother, Doug Pitt, was a big global success that cost relatively little compared to traditional ad campaigns. Providing social content that quickly reacts to current events as the next big opportunity for Virgin Mobile and other brands. But Mack warned it is not without its dangers. How to command conversation: 3 social media command centre examples Oreo scored a major win when, during a blackout occurring in the Super Bowl, it sent out an image advertising that customers could still dunk their Oreos even in the dark. To make that happen, the cookie maker had dedicated a 15-person team of social marketers to the sporting event. On the other hand, clothing maker, Kenneth Cole, suffered a major PR disaster when it went to Twitter to imply that uprisings in Cairo had something to do with customer interest in its Spring sale, said Mack. It can be a challenge to get executives behind social marketing initiatives, admitted Mack. “Structurally, what we found to be a challenge a couple years ago when we were trying to introduce a social-by-design mentality is getting marketing directors and CEOs to think beyond a Channel Nine, 8:30 ad campaign…” she said. But with more examples of success emerging, these business leaders are becoming easer to convince, she said.